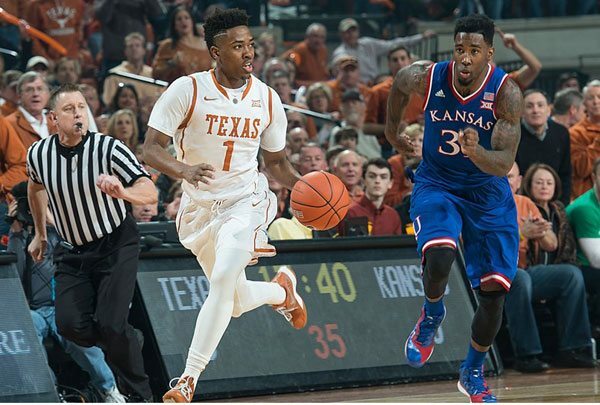 Isaiah Taylor versus Kansas (Photo: courtesy Texassports.com). All the pyrotechnics, loud music, orange and white balloons falling from the ceiling and bravado produced prior to the game were no match for Kansas’ steady, fundamental basketball as the 11th-ranked Jayhawks ran away from No. 17 Texas in the second half in a 75-62 win Saturday before a capacity crowd of 16,540 at the Erwin Center. Kansas got a team-leading 15points off the bench from freshman Cliff Alexander and double-figure scoring from three other players, Brannen Greene (14 points), Perry Ellis (14 points) and Frank Mason III (12 points). Greene hit on four of his five 3-point attempts. The Jayhawks (16-3, 5-1 in Big 12 play) shrugged off a torrid start for Texas, steadied their ship with their own hot shooting streak and took a 32-30 halftime lead.